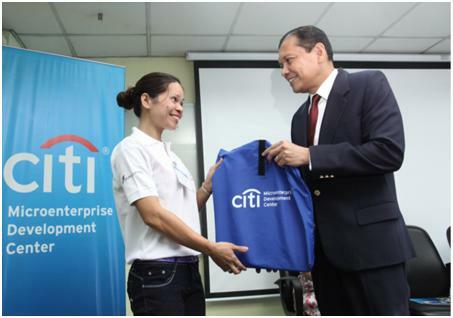 Manila – Citi Microenterprise Development Center (CMDC) recently opened its doors to a new batch of student-microentrepreneurs, signaling Year 4 of a very successful partnership between Citi Philippines and Bayan Academy for Social Entrepreneurship and Human Resource Development Inc. Funded by Citi Foundation, CMDC was established to promote entrepreneurship among low-income microfinance clients, giving them the opportunity to receive quality training and customized coaching and business advisory from a pool of subject matter experts that include Citi employees. After a successful pilot to over 100 microfinance clients in 2010, CMDC was formally launched the year after and it has since nurtured nearly 1,300 high potential microentreprenuers. This year, CMDC hopes to reach out to another 870 microentrepreneurs across Luzon, Visayas and Mindanao. According to the Department of Trade and Industry, the Philippines has a large microenterprise sector that accounts for 89% of all registered businesses. However, most of these businesses fail to grow to become small- or medium-sized enterprises primarily due to the lack of critical skills by the entrepreneur. Through CMDC, Citi and Bayan Academy seek to address this skills gap and empower entrepreneurs to grow and sustain their micro businesses, and eventually scale it up to the next tier. Attesting to this statement was Bienvenido Manglo, a CMDC graduate from 2011 and proprietor of Bensley Marketing that distributes a wide range of Philippine made products, from bags to handcrafted decors to souvenir items. Armed with passion, dedication, and knowledge earned from CMDC’s courses, Manglo was groomed to become one of the most successful microentrepreneurs in the country. His monthly income has risen by 80%, while his assets grew by 54%. “Education is our gift to these people who later becomes our contribution to society as they create value to their enterprises and generate jobs for others,” said Dr. Eduardo A. Morato, Jr., Chairman and President of Bayan Academy. The CMDC offers participants a two-week course on Grassroots Entrepreneurship and Management (GEM) that covers entrepreneurship, including topics on self-mastery, personal finance, marketing, operations, human resources, and finance. The center is also home to the Citi Small Business Advisory and Coaching Services (Citi SBACS), a business clinic and advisory service that gives microentrepreneurs access to experts, including professors, practitioners, and Citi volunteers who provide coaching and mentoring services on specific business topics.